Whether it’s for a social media profile, product photo for online store, or an e-newsletter, fast and easy image resizing makes your life easier. With the Image Resizer tool for Mac, give your digital images the perfect size and configuration to suit a wide range of applications. Resize Photos - Easily change the size of your images by setting the percentage value. 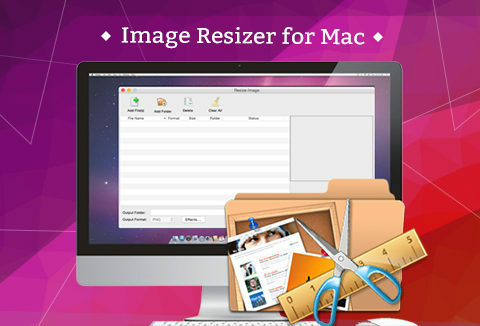 Rotate Pictures - This Image Resizer for Mac software allows you to freely revolve images at any angle. You can also enter the angular value (0~360) to the checkbox. Select the pull-down bar to set the direction and angle for rotating your photos. What's more, you can set the background color to your pictures as well. It enables you to add text and images as watermarks to your photos. You can also change the size, transparency and position of your watermarks as per need. If you want to add the same watermark to dozens of pictures, this software allows you to complete it in a batch. Get all watermarked photos within seconds. It supports conversion of photos from JPG, PNG, GIF or BMP format to each other without any limitation. After importing photos into this software, you are allowed to convert multiple pictures to the same format in a batch. You can preview pictures before outputting them. Display all images on the menu with file name, disk size, original size, status, and so on. All imported images can be converted at one time, which can highly improve your work efficiency. Fast Speed - Ultra working speed is highly supported by this tool for the entire workflow. Easy to use - Concise interface and quick user guide help users finish conversion smoothly. Standalone App - Work independently. No require of any other third-party program. I use this software every day. Easy to use. Perfect results! This software saves us so much time every day! Amazing Value!